My sinuses have been bothering me terribly lately; maybe I have a cold or something. It makes me feel all discombobulated so I can't think straight and can't write straight either. But here I go. 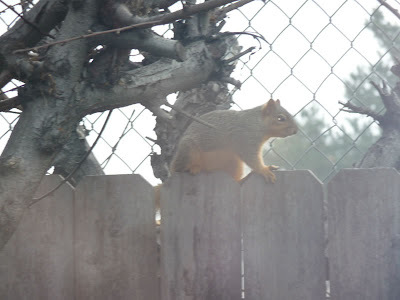 Before leaving for my regular Saturday morning Costco trip (sinus or no sinus), I snapped a couple of pictures of a chubby squirrel in our yard (it was from inside behind a window screen). Costco was pretty empty. I examined the various sinus relief remedies on the shelf. Some were capsules and some were kits where you stick something in your nose to clear it out. 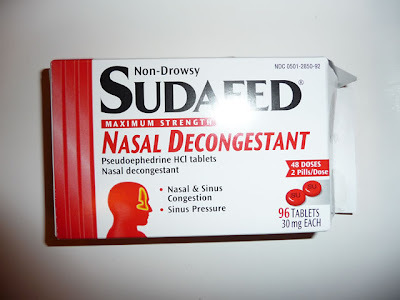 I didn't particular like that second option although it was cheaper, so I asked the pharmacist what she recommended for clearing my sinus and she brought out some behind-the-counter Sudafed. These were previously prescription-only. She had to write down my name, address and driver's license number and I had to sign for it as well! Well heck, my sinuses were making me feel horrible so I would do anything in hopes of obtaining some help. I remember when Greg was a baby, we had this big green syringe bulb-type thing called an "aspirator" that we had squeeze to push out the air, then stick in his nose and let the bulb expand and clean out all the stuff in there. He would have fits when we used that on him. Looking at those sinus remedies reminded me of those days. Below is the only other "new" item I purchased. I was examining the package and finally I noticed someone was calling me. It was a couple of people giving out free samples so I got to try it before buying. Healthy me went back and put the package of beef bourgognioneone (I don't remember how you spell it and have no idea how you pronounce it) back in the case and took these meatballs instead with the rationale that they were healthier. At least I didn't do what so many disgusting people do and just leave the package lying around somewhere, like on top of a stack of books. 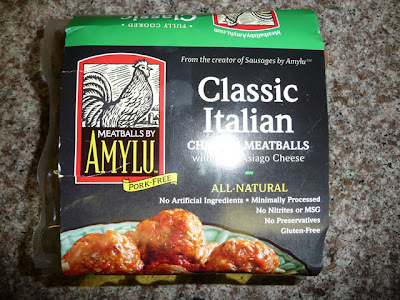 By the way, that word that is obscured by the flash is "chicken" and not "Chinese" - so these are Amy Lu chicken meatballs, not Amy Lu Chinese meatballs, lol. Thankfully the Sudafed helped. It made such a difference - the side of my head and my teeth were hurting and I even felt nauseous so I'm glad I bought it because all that stuff went away. This afternoon I spent some time calibrating the television using the "Video Essentials" disc I had bought several years ago and used on our old CRT television (which, by the way, was sadly donated to Goodwill yesterday.. remember a while ago I told you when I was little, I felt sad when I got a new pillow because the old one was discarded? Same feeling about the old tv. 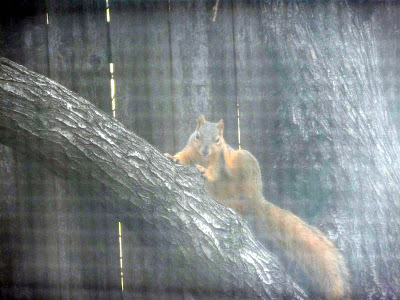 I hope it finds a good home because I had it for 14 years and it still had an excellent picture). Anyway back to the television calibration - it goes through procedures for adjusting the brightness, contrast, color, tint and sharpness. What you wind up with are settings that are quite different than how the factory sets them. This Sony comes with a "vivid" setting that I suppose they must use for showroom displays because it is like a woman with too much makeup - it's overly bright and overdone - it gets your attention but soon becomes wearing on the eyes, haha. Then there is a more acceptable "standard" setting which is more natural looking, and a "cinema" setting which is supposed to be friendlier with movies. The results I came up with are closer to the "cinema" setting in appearance. I watched part of Kill Bill in blu ray.. not for the squeamish. The level of detail was amazing and the scenes looked nothing like how I remembered them on the old television. If you've seen the movie, let me tell you the "spray" scenes are also a lot more vivid in blu-ray wide screen. That's about it for my foray into blu ray, though, since I haven't found anything else worth buying. I'm waiting for Star Wars to be released in that format although I suspect the detail might expose all of the special effects that were so amazing nearly 32 years ago. On the freeway message board was a warning to people that it was illegal to text message while driving. I can just imagine some people getting into accidents because they're reading that message board instead of watching the road. You know, I still see a bunch of people driving while holding a cell phone to their ear. A lot of good that law did. Friday was odd. I went to the bank and when left, I got into the left turn lane on Huntington Drive. In front of me was an SUV that was the same vehicle I was behind several days ago in that very same left turn lane. Now what are the odds of something like that happening? I know it was the same person because of the bumper stickers plastered all over the back of the vehicle, the type that try and make it seem like they are one of these "environmentally conscious George W Bush hating people." But here she was, talking on a cell phone! And driving an SUV. So don't go putting up those oh-so-concerned bumper stickers on your car if you're gonna be driving around in a gas hog talking on a cell phone! Ok, that was my rant for the day. As for the YouTube video, I chose this one to set a tone for the new year. This has been one of my favorites ever since I first heard it being played at the old Fedco store on La Cienega back in 1969. It's simple, elegant and beautiful and let's hope 2009 turns out to be the same.